It was Toby’s birthday on Sunday, and we can’t believe he’s a year old already, and that exhaustion has been our way of life for that long. Plus lots of happiness of course. He just seems to get more and more fun right now. The biggest effect on him is that we have turned his car seat around in the car – he’s allowed to be facing forward – and he loves it. He has been giggling pretty much the whole time we’ve driven him so far. I’m sure he likes not feeling so isolated back there, he was getting quite fed up of being put somewhere he couldn’t see us. On Sunday evening Emma was turned around in her seat, blowing raspberries at him, which he was trying to do back but was laughing so much he couldn’t. Just a joy to hear. A smart comment, I’m sure you’ll agree, when the poor are finding it hard to pay heating bills, the elderly and infirm have problems venturing outside and of course the homeless face the uncertainty of finding a place to sleep for themselves and their families, the alternative being – well, what do you think? But I’m sure it was a joke about how the well-heeled would rather move south, so that’s all right then. Anyway, I sent them a note via their website, and it appears that the offending phrase has been removed quite quickly (less than an hour). So I do at least commend them on their response time, if not their initial judgement. Poor Toby is teething like a maniac at the moment – you can feel at least four teeth all set to go at the front of his top gums. So we’ve not been enjoying a whole lot of sleep lately. Last night he got to sleep around 8:30 (good) and slept really well (also good). However he woke up at 2am (bad) and by 3:30 hadn’t successfully gone back to sleep in his bed – I thought he was out, but would put him down and there would be wailing and gnashing of gums. Urgh. So Emma took him through to our bed which was half-way successful. He did sleep for intervals, but would wake up every half hour or so. Then I read this article and despair as to whether I’ll ever be mentally with it again (assuming I ever was in the first place). Oh well, I suppose this is why the Good Lord gave us coffee. Here’s a picture of Toby on New Year’s Day. 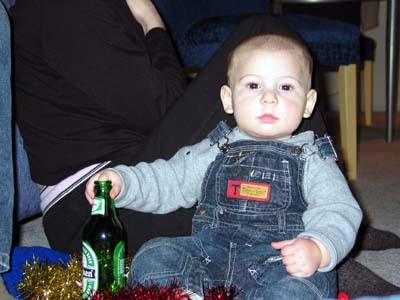 Yes, that’s a bottle of beer, but we gave it to him empty, which is perhaps why he looks so unimpressed. We do like our Saturn Vue, and are continuing to be really pleased with it. But from this year’s North America auto show I saw this concept car aimed at urban dads, and it seems my kind of thing. However by the time it comes out I’ll no longer be a new dad, oh well. In Toby news, his report from school today said “Toby took three steps this morning, and continued to practice all day”. You are currently browsing the andrew.mogendorff.com blog archives for January, 2004.